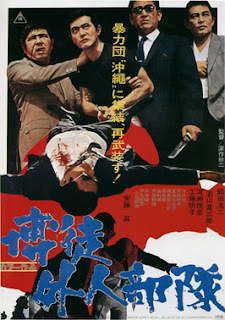 Right from its opening moments in which Koji Tsuruta’s yakuza Gunji walks out of prison after a tough ten-year stretch inside, it is clear that "Sympathy for the Underdog" (also known as "Gamblers in Okinawa") is going to be classic Kinji Fukasaku. Throughout the 1960s and ‘70s, the director made the crime genre his specialty, in the process turning out some of its most exhilarating and brutal products. With admirable skill, he made the most of its more alluring qualities – tough guys, gun battles and elaborate plots – while taking care to include the issues of power, corruption and morality that give these kinds of films such depth. "Sympathy" is no exception, with its central group of smalltime crooks making for some of the director’s most tragic antiheroes. Following his release, Gunji, almost always seen with shades fixed on his face, is joined by the last few loyal members of his disbanded criminal empire, all of whom trapped in lives ultimately less satisfying than what they’d imagined. When assessing his options for going back into business, Gunji is daunted: Daitokai, the company that sparked the gang war that landed him in jail, has effectively taken over the waterfront operations his clan used to control. Yet one last glimmer of hope exists for him and his men in the form of Okinawa. Gunji believes that his little gang can make a fresh start in the sunny island territory, and at first they make some progress in muscling their way in among the other yakuza already operating there. But soon they begin to lose their footing, and the odds against them continue to mount as they suffer casualties and learn of the Daitokai clan’s plan to move in on their newfound turf. "Sympathy" has a storyline that is inherently melancholic, and Fukasaku certainly makes the most of it. Gunji is clearly the titular underdog, and right away he has a difficult if not impossible goal before him. When he and his companions first arrive in Okinawa, they think they have come to an untouched land of promise, their hopes reflected in the upbeat music and excited smiles on their faces. They assess the main areas to take control of, which include the harbor, drinking establishment and prostitution rackets and a whiskey deal between one of the gangs and the Americans. Yet the early triumphs are soon overshadowed by the hornet’s nest of greed and violence that is stirred up, and Gunji’s group is eventually confronted by the harsh futility of their goals. Never that impressive or mighty to start with, the forlorn crooks become more and more pitiful as they retreat to sad bars, brothels and, eventually, an isolated resort with a pool and golf course. Fukasaku’s film is sure to remind some viewers of the similarly themed Takeshi Kitano-directed "Sonatine" (1993), as in both films, once-proud yakuza are beaten down by a changed world and, in fleeing to an idyllic paradise, only find themselves more alone with the bitter taste of their failures. This theme is reiterated in "Sympathy" when Gunji spends time with a prostitute who reminds him of the woman he left when he got sent to prison. At one point, as they lie together, they listen to a song about workers moving away from Okinawa to make money. Both the irony and the message are clearly communicated: the search for something better is simply part of a cruel and common cycle that never really ends. "Sympathy"’s tragedy is illustrated through Fukasaku’s patented approach to screen violence, which bursts forth in all of its fast and nasty glory. In one sequence, the director patiently cranks up the tension as Gunji’s group quietly stares down a gang of thugs across a bar before a fierce gun battle finally erupts. Cleverly planned ambushes and daring surprise attacks are frequent occurrences, in many cases acting as telling showcases for the cunning, audacity and nobility (or lack thereof) possessed by the various colorful characters. As demonstrated by the many dealings with foreigners and big companies that the yakuza gangs take part in within "Sympathy for the Underdog," Gunji and his touchingly loyal companions are more than a little out of their league in the new world they re-launch themselves into. Their solidarity, boldness and, yes, underdog status inspire viewers to root for them and their courageous plight even though they are all but bound to face a bloody and spectacular downfall. At least with Fukasaku at the helm, they will get the epic treatment they deserve. Surprisingly, this is probably my favorite fukasaku film. The score is also excellent. The end reminds me a bit of The Wild Bunch and Hideo Murota in it. Great film.